Gold prices recently hit $1,350 an ounce on mounting concerns about the strength of the U.S. economy, the weak U.S. dollar, and escalating tensions with North Korea. 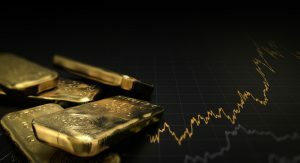 Bullion may be a at a 12-month high and some analysts are predicting a pull-back, but ongoing economic and political concerns could lift gold prices to $1,400 an ounce in the near-term. To add to the growing concerns about the U.S. economy, the unemployment rate ticked up to 4.4%. Meanwhile, U.S. wage growth continues to disappoint with hourly wages increasing just $0.03 in August to $26.39; a 2.5% increase from a year ago. The U.S. dollar Index, which is a measure of the greenback against a basket of foreign currencies, has fallen more than 10% since the start of 2017 at 91.89. The U.S. dollar is at its lowest levels since May 2016. Concerns about the U.S. economy and strength of the U.S. dollar have made many wonder whether or not the Federal Reserve will delay future interest rate hikes this year. Gold is priced in U.S. dollars and is sensitive to domestic interest rate hikes. Delaying an interest rate hike would further weaken the greenback and support gold price. There is a lot more to investing than stocks, bonds, and exchange traded funds. To profit on the markets, investors need to have a comprehensive understanding of different ways to invest. For example, gold and other precious metals are a safe haven investment that investors turn to both protect and increase their wealth. But timing is everything. That’s where Learn-To-Trade.com comes in. Learn-To-Trade.com is Canada’s oldest and leading provider of stock market trading courses. Led by licensed, industry professionals, the trading experts at Learn-To-Trade.com’s stock market trading course teaches investors how to trade more confidently and profit consistently. Through Learn-To-Trade.com’s stock market trading course you will learn how to read stock charts, understand fundamentals, risk management, and capital preservation. You will also learn about commodities, futures, stock options, stock index trading and FOREX (currency) trading.